Through research, conversations with America's top ODs, and industry experience, we've included everything you need to build, manage, and grow a team of experts in your practice. From hiring and training to conflict management and big change, we hope that our ebook empowers you to tackle any management issues or situations that might occur. If you've ever felt out of your depth when it comes to staff management, we get it. We hope to provide the guidance and tools you need. 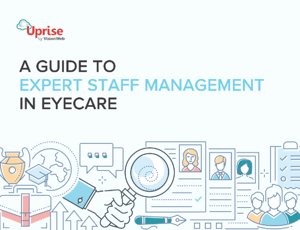 Expert Staff Management in Eyecare, helps you manage your staff through thick and thin.